David Southwood is director of science at the European Space Agency (Esa). Here, he casts an eye over recent discoveries in planetary science and astronomy and ponders how these might guide space exploration in the coming decades. We have been in space for 50 years. It is a long time and we have certainly come a long way so far. Where exactly will we be in space 50 years from now? It is hard to say. Let me start close to home. As far as the planets are concerned, I think that Mars has to be the number one target for years to come. Mars is the closest place to Earth in the Solar System. 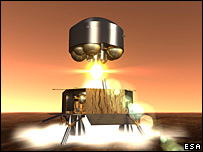 A mission to bring Martian rock and soil to Earth, called Mars Sample Return, is inevitably a primary objective for scientists. As my friend Professor Colin Pillinger at the UK's Open University says, "just put a piece of Mars in my laboratory and I'll tell you more about it than any robot could by crawling around on the surface". However Mars is a big place. We can't just study samples from one region. There must be long-term exploration happening in parallel - that is the only way we will piece together what is going on there. Imagine landing on Earth in Saudi Arabia and believing that tells you anything about what goes on in Greenland. There are connections between the two, but they are very different. But despite the fascination of Mars, it is fair to say that the two discoveries which have most amazed us in the last decade have both been in the outer Solar System and were made at Jupiter and Saturn, not on the planets themselves, but on their moons. The notion that inside Europa, one of the moons of Jupiter, there might be an ocean of liquid water poses a tremendous challenge to our scientists. How is it maintained and what does it mean for the habitability of this Jovian satellite? 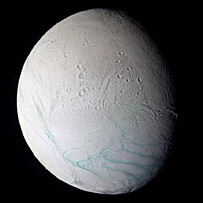 Similarly, at Saturn, the existence of liquid water geysers on the tiny, seemingly insignificant moon of Enceladus was totally unexpected. Such surprises mean we just don't understand our Solar System, and how it came to be. Should we send people out to the unpleasant environments we want to investigate? Isn't it better to let robots take the strain? I have to add, as an additional rider, Titan. You can't ignore Titan - the largest moon of Saturn. Titan has enormous potential to give us parts of the jigsaw that will allow us to figure out our Solar System. In many ways, Titan resembles the early Earth. It is not pure science fiction to fantasise one day in the far future, as the Sun grows older and bigger, a place like Titan being the cradle of something sentient like us. The potential for life is the key criteria for the selections above. But there are enormously important unanswered questions about our Solar System that have nothing to do directly with life. 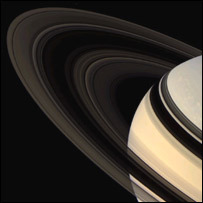 At Jupiter and Saturn, we have rings, huge numbers of moons - some of which are in the process of formation. They have much to teach us about how, once upon a time, our Sun gave birth to the planets around it. Robotic explorers, sent out on our behalf, will help us find out not just what is out there but also to address many of these questions about our Solar System. Nonetheless, there always remains the question of whether we send men and women out there with the machines. Well, simply on the Earth, we could have sent a robot to the South Pole. It might probably have been better than a human at analysing the types of ice found there. But what we remember is Mr Amundsen setting down his flag. In other words, sending people out into extreme environments is not just for science, but it is something we relate to as humans and must be thought of that way. However beyond our Solar System, manned exploration isn't an option. This is where robotic exploration really comes into its own. If you compare what we know now with what we knew in 1957, some of the biggest changes to our understanding have been in what goes on beyond the Solar System. When I was a student in the 1960s, black holes were a theoretical construct. They didn't really exist. We now talk about them as facts of everyday life. X-ray, gamma-ray and ultraviolet astronomy didn't really exist. Ground-based observatories cannot observe in these wavelength ranges. The opening of these fields of astronomy has revolutionised our understanding of planets, stars, the interstellar medium, the structure of galaxies and how the first light appeared in the Universe. One can say the latter because looking beyond the Solar System becomes exploration in time as well as in space. As you look further away, you look back in time. Back, even, to the beginning of time. After opening the X-ray, gamma-ray and ultraviolet views of the sky, came the capacity to look at the Universe in the infrared part of the spectrum from space. Making observations of the sky in the infrared band is very difficult from Earth, because the Earth itself, everything on it as well as the atmosphere all radiate infrared light. One can build observatories on very high dry mountains, for example in Hawaii, and this started not long after the space age began; however space has really changed things. 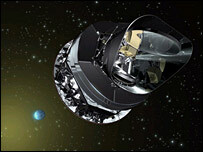 In Esa, we are about to launch the first of the next generation of infrared telescopes, the Herschel space observatory. Infrared astronomy opens up many areas. One area where it will be increasingly important in the future is in the study of extra-solar planets - a new research area that looks set to become a major component of astronomy over the coming years. It would be wonderful to find life on Mars. To do so would suggest the Universe teems with life. However that should not be the only place to search. What else is out there in that great big Universe beyond the Solar System? We are as much part of that as of the Earth in the sense that much of the material in our bodies was created long before Earth or Mars existed. Life requires a peculiar mix of chemicals. It is a complex cookery that went into creating our particular dish. Elements heavier than helium were created inside stars and heavy elements even come from the cataclysmic death of stars. The bottom line is that we are all stardust. This underlines the point that it is not enough to look for life on Mars without looking for life beyond Mars. Again space research takes us beyond the bounds of science and expresses a human need to know more. But the questions we are asking are of such a fundamental nature. Are we alone? Did this whole Universe have to happen just so that the right coincidence in the right place led to us? You can say this is all just about human curiosity; but maybe humans seem to be built to be curious. It seems to me that the questions above are ones any sentient being must ponder. When I was young, questions like these were strictly for the philosophers. Suddenly, these are issues for which scientists have important parts of the jigsaw. But as scientists tackle philosophical questions, we must keep clear heads. Albert Einstein disliked, more or less on aesthetic grounds, quantum mechanics. Well, Einstein was wrong. So we should not get too mystical. 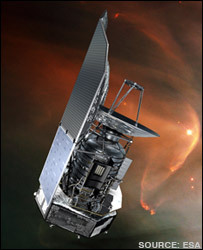 Coming back to physics, Esa's Planck mission, also to be launched next year, will look at the ripples left in space by the Big Bang when everything was physics, although where conditions were so extreme that it could be perhaps not physics as we know it. One basic conundrum is that the Big Bang went from being, presumably, symmetrical in all directions to producing the lumpiness that is fundamental to the way we see the Universe. In the beginning, there weren't any galaxies, or stars, or planets - what made matter aggregate? The clues are there in the echoes that remain of the Big Bang. Decoding them is more than using our present understanding of physics. One may also need to query the physics itself. The physics in the first few seconds of the Universe may have been different to what we have guessed. So here we may not be using physics to understand how the Universe works but exploring how physics works. Some of the questions raised here may have no final answer; they just give rise to a continual quest to expand our knowledge and see over the next horizon. Some would find this frustrating. For me, it makes me very happy to be a scientist. The questions will never run out. Some might say that if the search is endless, we are wasting our time. Nonsense! We are human beings and we live in a world of knowledge. The moment we give up the search, we as the human race have a real problem. It would mean that we would be losing our curiosity; we would be losing the underlying feeling that tomorrow can be different from today. That, I think would be catastrophic for our society. Can long-held dreams of sending humans to Mars ever be realised? Former BBC reporter recalls the highlights of 50 years in space.